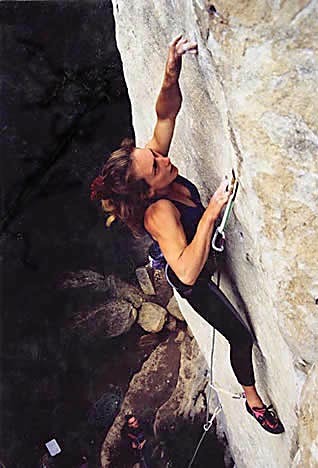 I started climbing in 1985 aged 17, totally mad for it and finally allowed to do it after having been inspired by someone on Idwal slabs in Snowdonia when I was 7. Since then I have led several E5s including The Cad E6 6a, Positron E5 6a, Get Some In E5 6a, Right Wall E5 6a and King Wad E6 6b, sea cliffs being the most fun. 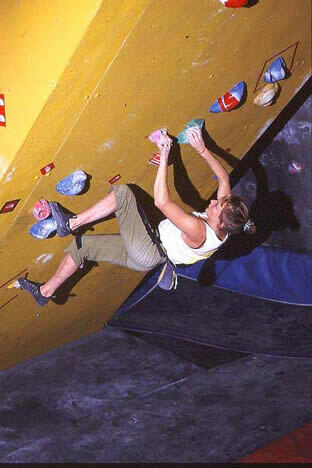 I have climbed extensively around Europe, the US and Thailand including onsighting 7b+, and have climbed Cauchemar de l’Elephant (Fr 8a), the second 8a to be climbed by a British woman. Six Alpine seasons from 1988, including an ascent of Mont Blanc (4800m), the highest mountain in Western Europe. Evading capture by the Taliban we climbed ‘The Philosopher’s Stone’, E6 6a (1000m). Jungle rock climbing, making first free ascents of big unclimbed walls on ancient tepuis.